I finally decided to take the plunge and create a Facebook fan page for this blog. I spent a lot of time tonight increasing my connections with other bloggers and blog communities. It has me wondering if I will be able to keep up with it all, but I am enjoying the adventure. Reading all these other blogs has been fun. The biggest danger right now is wanting to try all the new craft ideas I'm finding! 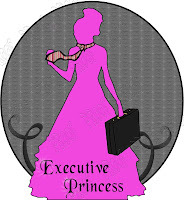 I hope you'll join me on my fan page and help direct me on what to offer on this blog. Etsy has now made it possible to search treasuries. This is something I wished for when I first started on Etsy and couldn't figure out why they didn't already do it. The main way to find out if someone included one of your items in a treasury was to use an outside site like Craftopolis that use Google Analytics information to show what treasuries you may be included in. It worked decently enough, but depended on somebody clicking on your item in that treasury at least once in order for it to show up. Newbies on Etsy don't know that right away and don't automatically click on each item in their treasury when they create it. Searching the Treasury now works like the other searches. You can search for a term like beaded or cowboy, but I believe this part depends on what tags the treasuries' curators included. The best part is that you can search for your shop. If you just enter the name of your shop in the search box while in the Treasury, you will get all of your treasuries you have created plus any that have items from your shop. Putting curator: yourshopname in the search box will give you all the treasuries you have created. Putting shop: yourshopname in the search box will show you just the treasuries which include an item from your shop. Of course you will want to replace yourshopname with the name of your Etsy shop. I found my items in two other treasuries this way. Since my items hadn't been clicked on in those treasuries, they didn't show up on Craftopolis. If you like to support the Treasury concept, you will want to know the term "C&C" or "C/C." People often promote the treasuries they have made by putting links in forum posts or sharing them with their Etsy team. 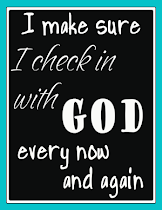 Others will help out by visiting the treasury and C&C or click and comment. Etsy has some magical formula for determining the "hotness" level of each treasury, with the hottest ones at the top. The number of clicks on items and comments left in the treasury are assumed to be part of the hotness formula, so clicking and commenting helps boost the popularity of the treasury. The hotter it is, the closer it is to the top of the front page, making it more likely to be seen by others. There is a time factor involved as well, so hotness fades over time. Why do people care about these treasuries? Well, they are a lot of fun to put together. I made a super challenging one once with items that had arrows and I lined them all up to lead you around the page. It was super cool, but very difficult to manage once some of the items sold. The other reason is that Etsy chooses treasuries to be featured on the front page (FP). 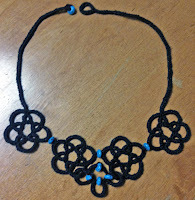 I tatted a different version of this necklace with mostly white tatted flowers and one black tatted flower. I wasn't crazy about how it turned out and decided it might look better with fewer motifs and with the beads in between. The black Senso crochet thread I used made it even more difficult since it was quite thick. It also had glittery plastic strands running through the thread, adding to the complications. The beads between the flower motifs were threaded onto picots. After the first one, I learned to make the picots longer so it wouldn't be quite so difficult to join the motifs. When the flowers were done, I played around with different things to hang from the middle of the necklace. Many, many mistakes were made on this part of the project. 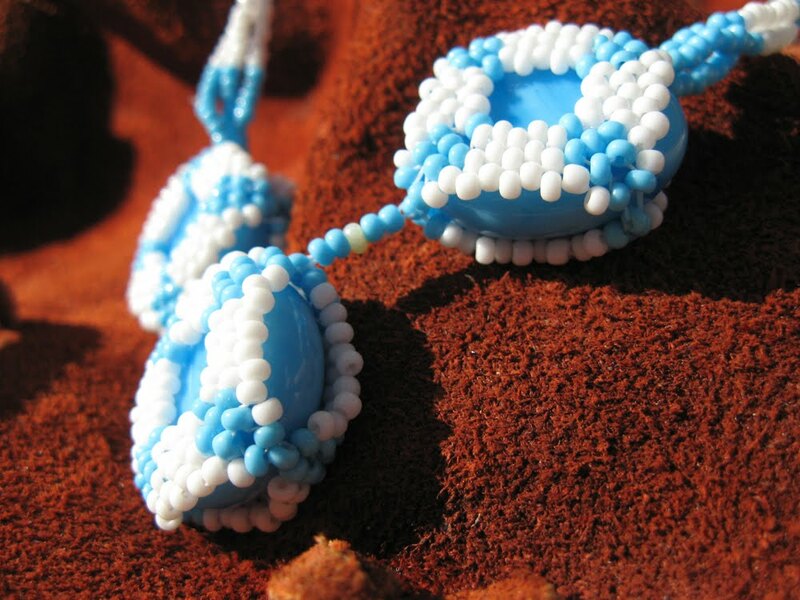 I would forget to put the beads on the thread before starting, or let the beads slide down to the ball of thread, making them unavailable for use. 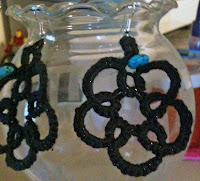 Then there were the rings I linked through the wrong motif or the wrong part of the right motif. I'm surprised I didn't run out of thread before finally getting it right. Once the necklace was complete, I decided that I should make some matching earrings. I'm not exactly thrilled with where the beads ended up... Maybe I'll make another pair tomorrow with the last of my thread. I do like the soft feel and the chunky look that the Senso thread gave, but the many strands twisted together were very difficult to manage and sewing the ends back in took a lot of effort. My next plan is to figure out how to display it for photos and get it listed on Etsy. I wouldn't mind keeping this one if it doesn't sell, though. You won't browse Etsy for long before running into the abbreviation "OOAK." I usually pride myself on being able to figure out abbreviations and acronyms, but I ended up Googling this one. OOAK = One of a kind. I have a couple of items in my shop that are OOAK. The newest is pictured here. I didn't list it that way, but I don't think I'll be making more. For me, a one of a kind item is usually an accident or experiment. I start playing around with something and end up not writing down the pattern. 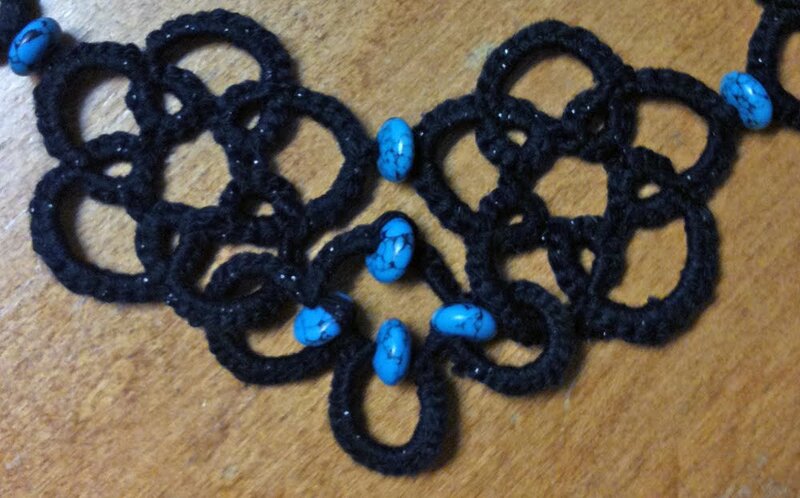 This brooch started when I was showing a friend how tatting looks. I kept making ring after ring, ending up with a layered looking flower, and then secured it to a pin back and added a turquoise bead. Kind of weird and messy, but I love those colors together. I actually prefer thinking of it as a one of a kind rather than an experiment or accident anyway. I just got a new book of tatting patterns to try. It's "Tatting Patterns" by Lyn Morton. Part of what attracted me to this book was that the patterns looked like ones I could handle without getting too frustrated. Quite a few of the patterns incorporate beads and I've been wanting to learn to work with beads in my tatting. 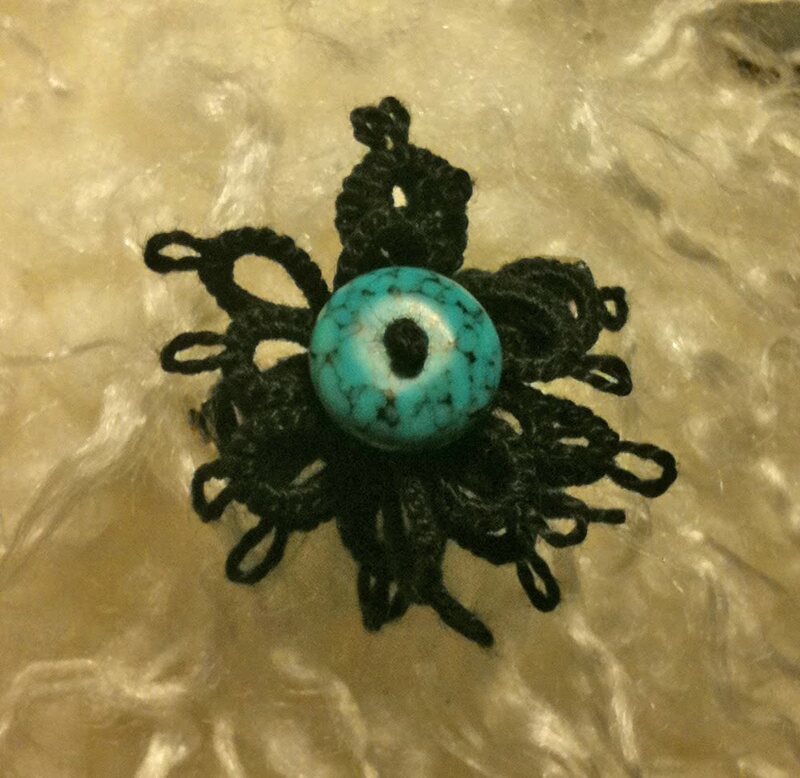 There are some cute jewelry pieces I want to try and tatted corsages that I definitely want to make. She includes a pansy edging and I LOVE pansies! What makes them look great in the book is they are done in a purple variegated thread. I will be adding that to my shopping list! I replaced my Aero shuttle last week. I have all my bobbins, but couldn't find the shuttle anywhere (dang kids!). I found a great Etsy shop called Creative Stitches that had the shuttle I needed. She shipped it faster than anything I've received through Etsy yet! You will notice that there is a box on this blog that shows some of my favorites that I have discovered on Etsy. It's always changing because I never stop liking some of the new things I find. Many of the items are things I would love to buy if I had unlimited funds, so it's really more of a wish list. 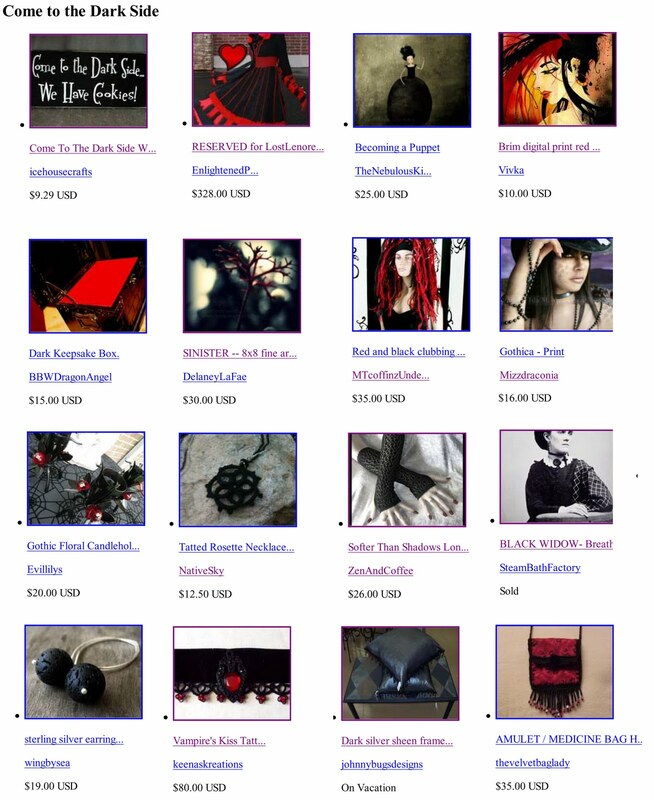 I also have shops/sellers that are favorites because I can't just pick one or two things I like. Some of the other artisans are so amazing! One of them impressed me so much that I just have to share. The Midnight Orange has clay sculptures that represent so many emotions. Those who know me personally can tell you that I'm an emotionally gifted person (=moody). Having experienced a lot of things in my life that propelled my emotional roller coaster, I love what artisan D. Antonia Truesdale has done with her shop. The emotions of life, death, birth, abuse, love, family, and more can be found in these simple, yet inspirational sculptures. One of them reminds me of how much I loved how my husband treated me when I was pregnant. Others show the agony and pain of abuse. 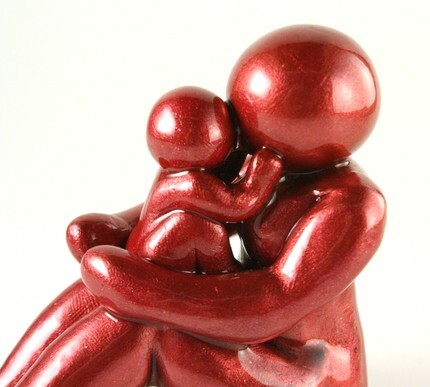 Purchasing of some of these sculptures sends a donation to fighting sexual abuse. 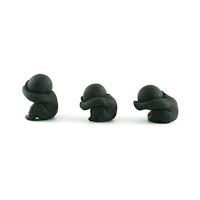 There is one set of three figures called "Some days are harder than others" that could represent everything from a tough day to abuse. I think I've had many days represented by these figures. The last one I'm including is called "Please Grow." I actually didn't notice it until today when I started writing this. My face lit up with a big smile because that is how I am with plants. I want so much for them to grow and have been know to overwater them on accident. I even talk to each little plant in my garden to encourage them to grow. I'm sure all of us put a lot of of ourselves into the items we make. Tatting brings me a lot of peace and joy and I love being able to share it with others. 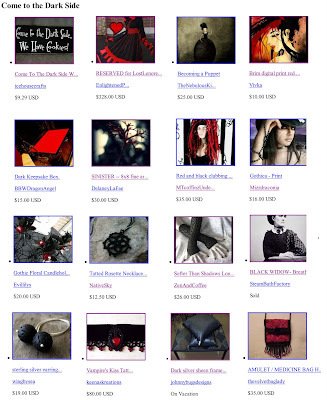 The Midnight Orange has taken that to a whole new level and I have seen her design custom items for those who are grieving as well as those excited about a new arrival. Please visit her shop - I know you'll love her creations, too. Actually, I'm back in two different BNR (buy & replace) treasuries right now. If you want to see how crazy they can get, check them out. One of them is done by a group of people who take turns curating or managing the treasury. This is no easy task since there were about 70+ sales in the first 12 hours. They have to confirm the transaction and replace the seller's item with an item from the buyer's shop. The other treasury is moving a little slower, but it's still moving. One of the things I see happening to people is they buy an item to get into the treasury and then every time someone "buys them out" they look for another item to buy in order to get back in. That means the same group of people just keep buying stuff from each other, round and round. When the system works well, other interested people wander past the treasury and get into the mix. No matter what, you do get more people checking out your shop. Someone put a request on Alchemy the other day for Pee Pee TeePees. Curiosity got the better of me and I just had to find out what those were. A quick search brought me to this site, where the Pee-pee Teepee has been trademarked. Turns out that it's a fabric cone to prevent getting a "fountain show" while changing baby boys. Where was this when my boys were in diapers? I remember the night I cried myself to sleep after changing the baby after he messed his diaper and it overflowed everywhere, then he peed on me while I was changing him, and then he spit up all over himself and me once I got him changed again and fed. It was new mommy overload! Others offer a similar product, but with less spectacular names - caution caps, pee-pee cones, tinkle tents, and pee-pee tents. There are even tutorials for making them yourself. The pee-pee teepee will forever live on in my mind and make me giggle a little. To add to the frustration, I took on a project for someone who doesn't seem to know exactly what they want. When I submitted a design, she said "I don't like the colors. I don't like the person." It took everything I had to not explode on her. The problem is not that she didn't like it. The problem is that she didn't help me at all in understanding what she wanted me to change. I replied with a lot of specific questions and pointed out that I didn't want to copy exactly the stock images she had sent because that would be wrong. Her response was that stock images are used by lots of people. True....but they are supposed to be used by people who pay to use them. The reason they put a big old copyright mark in the middle of the image is because they don't want you to use it for free. No matter how much she might like the image, I don't think she'll be too happy when someone sues her for using it in her logo without permission. I've been bidding on more Alchemy jobs (yes, I'm crazy). The upside to Alchemy is more instant jobs and when you finish an Alchemy job, an image of your project is displayed for awhile and lots of people end up looking at your shop. The down side is all the time spent checking on jobs and buyers leading you on. I don't mind sharing ideas back and forth with someone, but when they keep it going and give you the impression that you're working on the design, it's not cool when they decide to formally reject your offer while you're working on the design. That's what happened to me tonight. It sounded like we were on the right track and I was pretty excited about working on the design. When I got back with an early draft based on the buyer's instructions, I found an email saying my offer had been declined. REALLY?!?! That's fine. I'll keep the image and find a way to use it in another way. I was working with another buyer the same way and just sent her a message letting her know that she will have to formally accept my bid before I can do any work on the project. I'm guessing that I will get that rejection soon too. I've had rejections where the buyer mentions that someone offered to do the work for free. How do I compete with that? It's against the rules on Etsy since it cuts out their percentage of the sale. Time to pull it back in and get back to my tatting. Believe it or not, Etsy has teams. The purpose of these teams varies - social chatting, sharing information, marketing and promotion... There are regional teams and team which gather around themes. I actually asked to join a different team earlier, but I was rejected. Their purpose was marketing and promotion and they strive for diverse shop offerings from their members. After a lot of searching, I found another team that interested me. It's the Etsy Fiber Arts Street Team (EtsyFAST). My tatting fits in with their group and I noticed some other tatters on the team. I'm excited about getting to know some other Etsians and having some help in promoting my shop. It's pretty tough out there and it's hard not to be invisible in that sea of crafters.